“The Shaman’s Apprentice,” by B Muze, tells the story of young Jovai, a girl who encounters her fair share of hardships, spirits, and war. This novel takes place in a seemingly primitive world where people still live nomadic lifestyles and go to war with each other just for something to do. In this same world, people also rely on and listen to spirits, living on only because of the gifts the spirits grant them. The shaman communicates with these spirits and it is when Jovai is chosen to be the shaman’s apprentice that the story begins. Muze succeeds in many different ways with this novel, but none so prominent as the intensive and fascinating world that this story takes place in. Jovai’s world is complex, layered with traditions, history, and magics that weave an immersive narrative. Muze strikes the perfect balance of giving enough of this world to the reader without overloading the narrative. Despite having a seemingly slow and simple start, Jovai’s journey soon follows an intricately laid and well-thought out plot, proving Muze’s ability to craft a narrative that pulls the reader in with every page they read. Not only is this novel rich with fantastical elements, but it is also ripe with real world allegories. Primarily, it tackled the patriarchal conditions that both removed Jovai from her life, and rejected her as shaman’s apprentice. It is the same bias, and complicated interactions with other cultures, that eventually drives Jovai’s people to rebel and push her out. Once on her own, Jovai’s real journey begins, one where she finds her inner strength and tries to understand the intricate world around her. At its core, Jovai’s story is a about a young woman trying to find herself in a world that seems to have no place for her. It is her journey and the hope that she clings to along the way that made Jovai such an endearing and well-written character. Despite the young person coming-of-age being a common trope within fantasy, Muze’s story seemed refreshing. Though some elements of the story were influenced by genre, the novel felt wholly unique in its conception. If anything lacked in this novel it would be that it was almost too much to take in. I loved the complexities of the world but felt that I was reading several small novels rather than a single novel. It’s interesting that this is the first in the series, as the full story told within this novel felt like a series itself. I enjoyed reading it, but was amazed and perhaps overwhelmed by just how much happened within just under 400 pages. As a fan of fantasy, the breadth of the work was okay with me, but it’s easy to see a lesser-read or fantasy novice getting overwhelmed by all that happens within this opening novel. 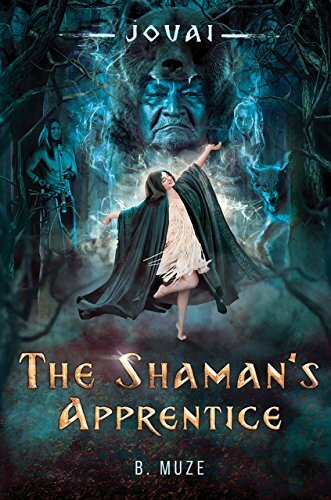 As such, I would say that B. Muze’s “The Shaman’s Apprentice” would be perfect for anyone wanting to fully immerse themselves in a complicated and spiritual world. Overall, it succeeds in being a tale of a young woman finding her strength in a world that otherwise rejects her. The story feels simultaneously timeless and refreshing, relying heavily on the beautifully crafted world to see it through. I’m looking forward to continued work in this series and seeing how Muze can continue to make this world shine.